We had a ten year old boy in the house a few weeks ago. It’s okay, – it was with the full consent of his parents and I was supervised the whole time. 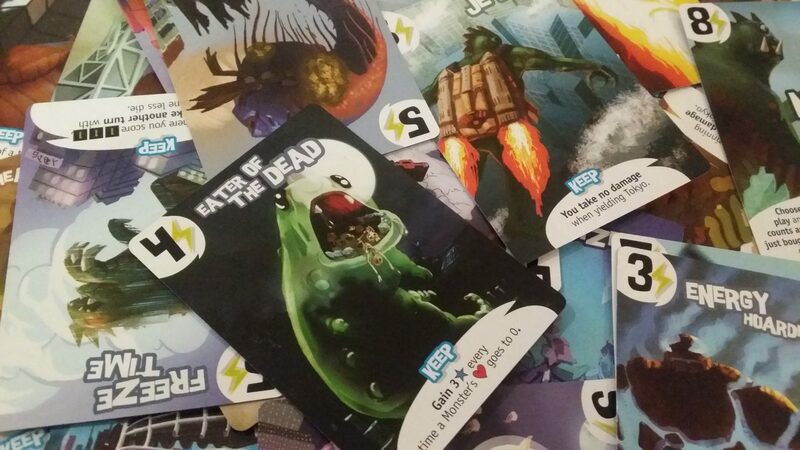 I took the opportunity to try out a couple of games aimed at the younger end of the age spectrum. 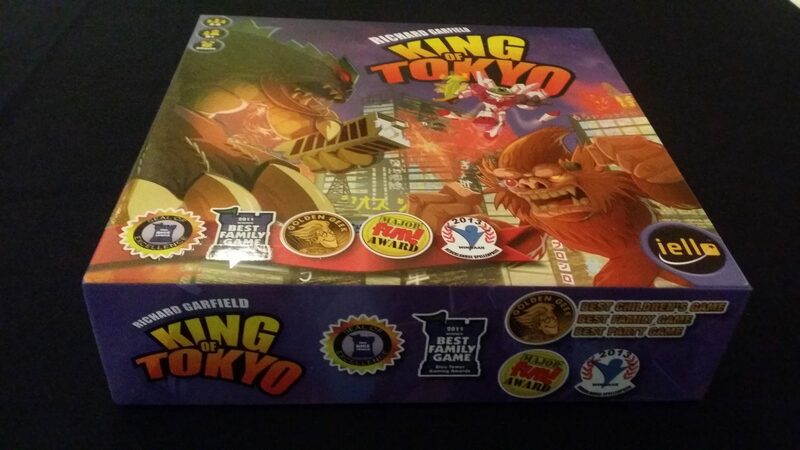 One of those was King of Tokyo, a game which I’ve seen many people rave about but had never had an opportunity to play as anything other than a two player tag team variant. 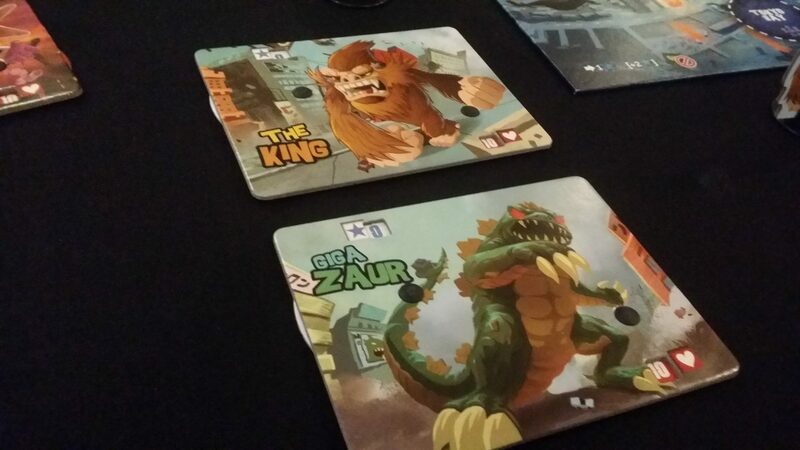 That was okay, but the meat of King of Tokyo comes in with a proper all out fist-fight between three or more players. And the more, the better. I could see how its moving parts meshed, but I wanted to hold out on a review until I played it a few times under the right circumstances. It turns out, the right circumstances are with an excitable child at the table living and dying with every roll of the dice. And then you roll dice until someone wins. Huh, I guess sixty seconds is a longer period of time than I thought. What am I going to do with the fifty-seven seconds I have left? I guess I could elaborate. So I’ll do that. There’s a big rampaging bipedal lizard that is ABSOLUTELY NOT GODZILLA! There’s a massive ape, which is ABSOLUTELY NOT KONG! There is a bunny in a robot suit which is ABSOLUTELY NOT… well, I have no idea what may have inspired that. You’ve got aliens, and sea creatures, and the sinister looking ‘Meka-Dragon’. You have destructive capacity packed into a decent variety of uniquely designed vessels. You pick one, and that’s you! Then you take the elegantly designed character card for that monster. Each card comes with a wheel that is rotated to adjust health and victory points. You start off with ten of the former, and zero of the latter. The first to twenty victory points wins. That is, if they haven’t first defeated their opponents through martial mastery or violent pummeling. To begin with, all of the monsters are outside of Tokyo, and as such they can’t hit each other. 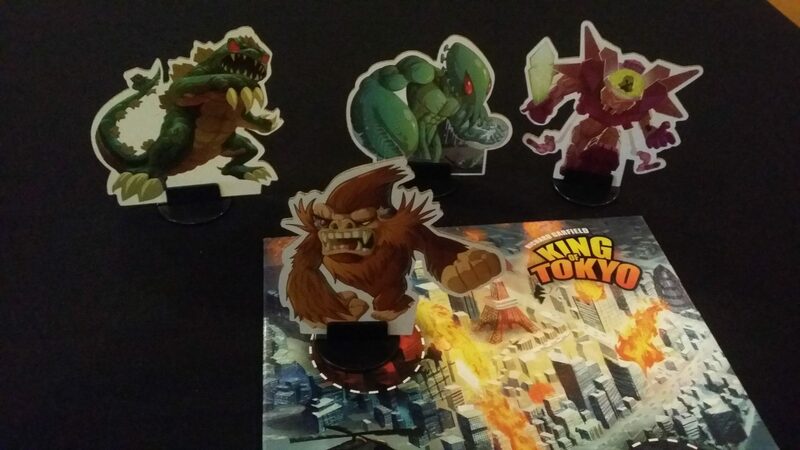 King of Tokyo is a King of the Hill system – everyone is fighting the monster (or monsters, in a larger game) in the city, and the monster in the city is fighting everyone else. When a monster is in Tokyo, some special rules apply. You get a victory point when you take control of the city, and you get another two if you start your turn inside. But, and this is where the thinking comes in – you can’t heal while in Tokyo. And while in Tokyo you are the sole recipient of every single point of damage inflicted by every other player. Sure, you’re hitting all of them as well, but there are so many more of them than you. That’s the strategy. But this next part is where the fun comes in – if you take any damage at all, you can choose to yield control. When you yield, whoever just hit you takes your place in the city. They get a victory point, and then they become the target of the merciless pummeling of everyone else. Including you! They don’t get to choose if they’re entering the city – they’re it. If you time it right, you can catch someone completely off guard and leave them stumbling into a city they’re completely unprepared to hold. 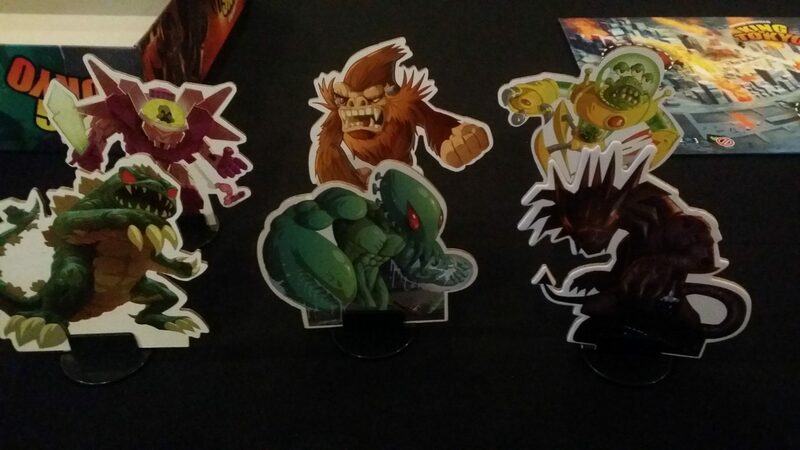 It might seem like a good idea to kick several shades of snot out of the King of Tokyo, but you better hope you can follow through if they yield. How much damage can you inflict before they need to leave? Should you hold something in reserve? Should you go for a light attack and hope it’s not enough to force them out, or go for all-out attack knowing that at least they’ll be in no position to counter-attack on their turn? But what if it’s not actually up to you, in the end? Each turn, you roll six dice. You keep what you like and reroll the rest. And then you keep what you like out of those, and reroll one final time. Whatever you end up with is what’s happening on your turn. Hearts mean heals, unless you’re in Tokyo. 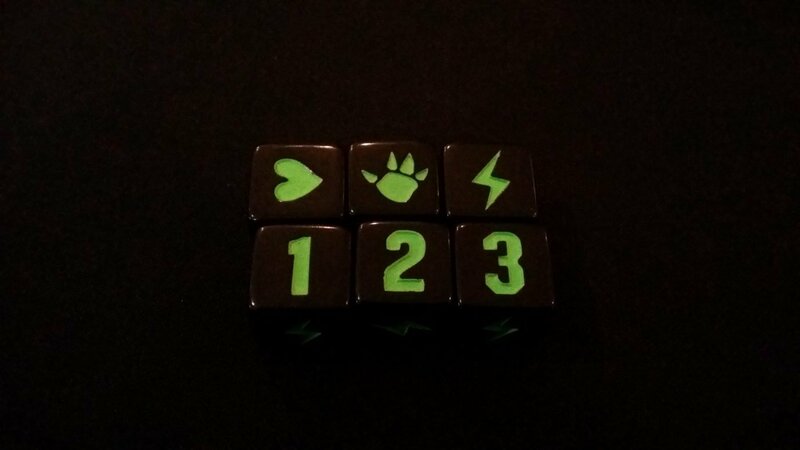 Claws mean attacks, lightning bolts mean energy, and numbers mean victory points. Roll three of the same number, and you get that number of victory points. For each additional face of that number you roll, you get another point. 3×3 gets you three victory points. 3×2 gets you two. 4×3 would get you four. This instantly creates a nice puzzle to solve – what’s going to work better for you, and what are your chances of getting that outcome? You might want to heal six points of damage, but the odds aren’t in your favour for that. You might want to inflict six points of damage but hey, good luck buddy. Focusing on a goal is important for a game which is all about burst activity, but you risk diluting the impact. Victory point rolls are worth nothing if you don’t get three of the same number – is it better to reroll those and hope for something you can use, or reroll the one die you have left and hope you make the triple? It’s Yahtzee, yes – but Yahtzee with bite. And unlike Elder Sign, it’s Yahtzee with meaningful decisions and a framework for executing strategy. The lightning bolts give you energy, and that’s money. At the end of your turn, you can spend your accumulated energy on an upgrade – and here’s where the game becomes bananas. 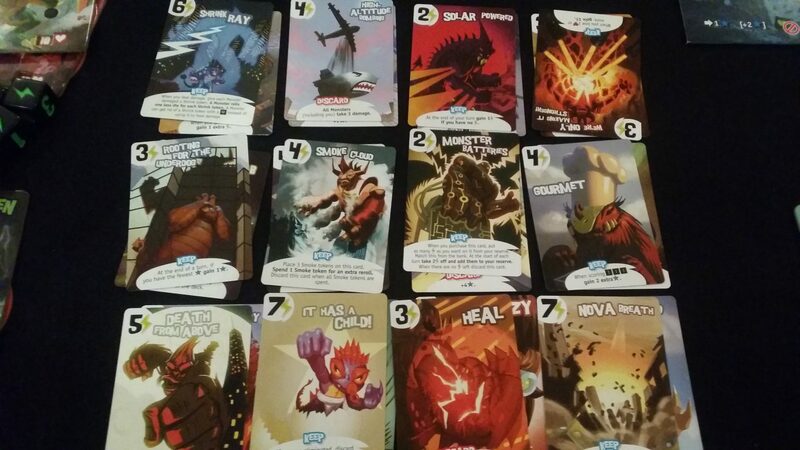 Some of these are permanent upgrades (marked as keep), and some are one off special attacks (marked as discard). The range of these is fantastic. There are sixty six of these cards and each one is unique. Some let you roll extra dice and some gain you extra victory points. Others cards let you dock victory points off other players. Some let you come back when you’re killed, or earn health when your enemies fall. Some let you leave Tokyo without taking damage, others change the fundamental tempo of the game. They alter the dynamics of play – maybe your attacks, for example, impact on everyone and ignore the usual in/out Tokyo rules. Maybe that’s a card worth saving for, but just think of all the opportunities you’re going to have to give up. Some of the cards are pricey. An extra head at seven energy gives you an extra die on all future rolls. A giant brain gives you an extra re-roll every turn, but at the cost of five energy. Maybe you want a shrink ray for six energy – it lets you inflict a powerful debuff on all your opponents. Of course, you want all of these things but when you’re earning money you’re not inflicting damage, healing your wounds, or accumulating victory points. This is a game where you can be knocked out in a single round – can you really justify long-term saving? Just how much utility are you going to get out of that extra head? Is it more than the dice you spent getting it in the first place? 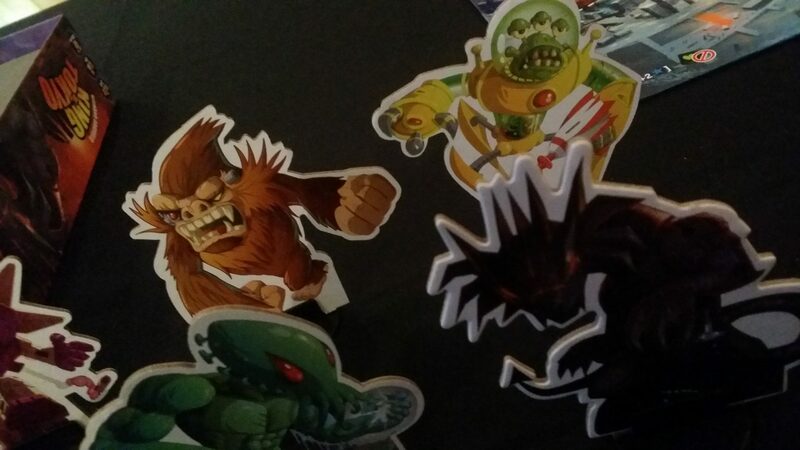 Even if you can justify the investment, every turn the King of Tokyo is accumulating victory points. You can’t just leave them in there, because they’ll probably win through the gradual accumulation of advantage. You, and the rest of the monsters on the outside, need to force them out. That’s done with damage. Wads of damage. Brutal, savage, overwhelming masses of burst damage. 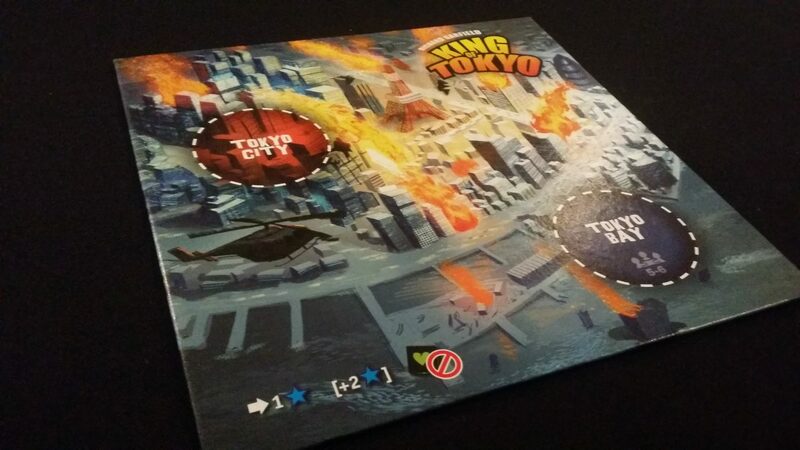 Be honest – do you want to be the one that forces the King of Tokyo to yield? Maybe you’re going to leave that up to someone else. But… maybe they’re leaving it up to you. Maybe the King is not even worried about victory points – maybe they’re going to go for damage output, winning victory through the spilling of blood. So perhaps you’d best think about healing? What’s the best thing to do? Who knows! Everything is worth doing, but you can’t do all of it at once. It’s a tight design that manages to elevate dice-rolling into a challenging and ongoing task of risk assessment and balancing of short versus long term gains. And on to that it attaches a social game of reading everyone else at the table to work out how you are going to best accomplish the communal goal of ‘making sure the King of Tokyo doesn’t win’. Every time that position is yielded, the equation changes and your priorities will shift with them. The dice then throw in a point of maximum pressure upon which success and failure will pivot – not so random that you can’t influence the outcome, but not so deterministic that you can guarantee the resources on which your strategy hinges. You can tighten the probabilities into a narrow window, but you can’t control them. I genuinely found myself yelling in triumph when I got exactly the result I needed on the final dice roll, or cheering when the King failed to do the damage needed to knock one of us out. Everyone at the table is locked in an ever-shifting alliance where there’s only going to be one winner. You’re all allies against the King, but the King will change turn to turn. The enemy of your enemy is your friend, but friendships are as transient as the flame of a match in a thunderstorm. Our ten year old house-guest was so deeply involved in his struggle for survival that he’d be pacing the room, whimpering as the dice were rolled against him, succumbing to the intense despair of inevitable death. And then he’d whirl on an emotional sixpence as his single health-point allowed him to cling to victory and heal a substantial chunk of damage in a round. He was the perfect microcosm of the emotional roller-coaster the game design creates. But it’s good in terms of what it’s looking to accomplish, which is a quick knockabout game that doesn’t require too much on the part of its players. It’s a game that offers an almost perfect intersection of ‘enough to keep adults interested’ and ‘exciting enough to keep children engaged’. That is a tricky needle to thread, and the price paid for that necessary needlework is that there aren’t a lot of systems to master. As such, it tops out pretty quickly. This isn’t a game that takes minutes to learn and a lifetime to master. It just takes minutes to learn. The fun you have the first time you play it will be roughly the same as the fun you have the fifth time you play it. It’s fundamentally a game where the engagement is a transmuted property of the energy of everyone playing. Its role in proceedings is to facilitate that alchemy, which it does excellently. I’s not though going to be able to add fuel to the proceedings – it’s the spark that gets things going, but sustaining the entertainment is up to you. You can see that clearly in the standard two player game – this is not a game in which the rules themselves are offering a deep and engaging experience. This is a game that requires a critical mass of enthusiasm before it explodes into anarchic joy. I say that not to criticize, really – I say it just to explain why I consider it ‘good not great’. It’s not because it fails as a design – it’s not trying to offer the same beautiful complexity of Concordia or Suburbia. It’s just because the design adopted is one that has an inherent ceiling on its potential. It’s exactly as good as it could have been, and that’s not something I say lightly. As you can tell from my reviews of Star Fluxx and Elder Sign, I don’t really like games in which luck and randomness are the kindling from which gameplay is supposed to catch fire. The fact that I rate King of Tokyo as highly as I do, given the dice at its core, is testament to its fundamental soundness. It’s good! It doesn’t have to be anything other than that.